Earth’s Finest organic ‘Virgin’ and ‘Extra Virgin Raw’ Coconut oils are immensely versatile and can be used to create delicious food and drinks, a nourishing beauty agent for Hair, Skin and Nails and gentle enough to use on your precious baby. 1. As a replacement for Butter or Vegetable, Corn or Sunflower oil in cooking. Boost up the nutritional value of your Smoothie by adding a tablespoon of Coconut oil that contains vitamins, minerals and healthy fats. These very unique fats provide energy to your body. It’s great to have in the morning or just before a workout. 3. Try ‘Coconut Oil’ Mayonnaise – A healthier alternative to regular Mayonnaise! Blend 2/3 cup Coconut oil, 2/3 cup Olive oil, a teaspoon of Mustard, a tablespoon of Lemon juice or Apple Cider Vinegar, and four organic Egg yolks to make a great Coconut oil Mayonnaise. Not only is it aromatic, it is healthy too. Coconut Butter is made purely from Coconut Oil and is a great spread to use on Toast, Pancakes and Waffles. Throw in some Cinnamon, Honey and Nuts to make an exquisite spread or beat honey into it with a hand mixer and store it in your fridge to create healthier vegan butter for everyday use. Strengthening Hair Mask– Warm 3 tablespoons of Organic Coconut Oil in a saucepan over low heat, Set Aside to cool. Beat a raw Egg with the lukewarm Organic Coconut oil. Apply the mixture to your Hair and wrap it with plastic wrap or a bag for an hour. Wash your Hair with shampoo and rinse thoroughly, excellent for treating split ends and prevent hair from breaking. 2. Intense deep conditioner Mask– Mash 4 tablespoons of Organic Coconut Oil with the flesh of half an Avocado to create a very creamy paste. Massage into damp Hair and use a wide-tooth comb to spread it. Leave it for 20 minutes to absorb and shampoo and rinse out. Organic Coconut Oil has amazing Antibacterial and Anti-fungal properties. It’s excellent for scalp problems like moisture control to keep the scalp from over shedding. All you need to do is massage 2 tablespoons into your scalp for 5 minutes, let it sit for as long as you can and then shampoo thoroughly. Slather the area with Coconut oil, leave it on for a few hours and the sticky gum will come right off. A simple mixture can prevent greying prematurely. Simply grind a handful of Curry leaves with a little bit of water to make a paste, mix in 2 cups of Earth’s Finest Organic Coconut Oil and heat it till there’s no more moisture. Cool it done and store it in a bottle. Use it 2-3 times fortnightly and leave it overnight for best results. 6. Consuming Organic Coconut Oil, nourishes your Hair! Did you know that including Earth’s Finest Organic Coconut oil in your daily diet gives you long luscious and healthy hair! The advantage being that it nourishes both your hair and body from inside out. Take the Deep moisturizer prepared as above and slather it all over the body and drape warm towels around yourself. Stay as it is until the towels cool and the mixture has dried. The result will be glowing moisturized luxurious feeling skin. Organic Coconut Oil is generally rich in natural fatty acids and makes a super moisturizer. Use it right after a shower swipe a little bit out of the jar and smooth it all over your body to create soft supple skin. A Simple mixture of Organic Coconut Oil and Olive Oil in equal parts, gives the most effective treatment for parched and flaky skin. Adding a few drops of rose essential oil enables you to create a luxurious moisturizer with the most basic products. The simplest form of scrub is Organic Coconut oil mixed in with some Sea salt. Simply mix the two, lather it on your body and rinse off as usual. The best part about Organic Coconut Oil is there’s not one way but many ways to use it. Mix in 6 tablespoons of Organic Coconut Oil and Brown Sugar along with 10 drops of orange and lemon essential oils. Beat it till it turns soft and fluffy, and massage into damp skin. When you rinse off, a thin film of Organic Coconut oil will remain and keep your skin soft and supple. You can always store the extra in the refrigerator for next time. All you have to do is mix together half a cup each of brown Sugar and Salt in a bowl. Add 1 tablespoon each of Lemon juice, Honey and Organic Coconut oil; mix well and slather your skin. Use 1-2 times a week for amazingly smooth, brighter skin. Mix together 2 cups of liquid soap (or unscented body wash, 1 cup Rose water, 4 tablespoons Organic Coconut oil and 20-30 drops of Lavender essential oil. You can now use it as body soap and remember to shake it before every application. Massage Organic Coconut oil into your whole body to add a gorgeous glow to your skin. To enhance the glow, add some sparkling mica to your oil mix. Use it to remove the stubborn wax and moisturize after waxing. Take a Cup of Cocoa Butter, ½ a cup Organic Coconut Oil and 4 teaspoons of sweet Almond oil and place all on a double boiler over medium heat until the butter is melted. Pour it into a glass jar allowing it to cool. You can now use it anytime on your skin once it has been exposed to the sun to re-moisturize it. Have you been sunbathing or just been out and about in the sun? Soothe your heated parched skin with a liberal application Aloe Vera gel with a few teaspoons of Organic Coconut oil added to it. It’s high in antioxidants, prevents destructive free-radical activity (the primary cause of aging), and lessens skin spots or burns caused by over-exposure to sunlight. For a closer smooth Shave use Organic Coconut Oil. Just slather it and shave as usual, you will not only have smoother skin but healthier as well. Not only can you use Organic Coconut Oil pre-shave, but post as well and say goodbye to Razor-burn and hello to softer skin. Organic Coconut Oil has natural healing properties and forms a thin antiseptic and antibacterial layer that protects wounds from dust and germs. It also speeds up the healing process by increasing cellular turnover and stimulating collagen. So, use Organic Coconut oil on a scratch, scrape or small cut and your wound may heal faster and resist infections. It also helps reduce the chances of scarring. Place a cup of Organic Coconut Oil in warm water till it softens and mix in one cup of Almond oil and 2-3 drops of Rose essential oil. Store in an airtight container, using it as a full-body balm for when you are achy all over. Mix together 1 cup each of Organic Coconut oil and Jojoba oil, 20 drops each of Cypress essential oils and Juniper essential oils, and 10 drops of Lavender essential oil. Massage into the affected areas of the body and leave overnight for best results. Mix in 4 teaspoons of Shea Butter, 3 tablespoons Organic Coconut oil, 2 tablespoons Jojoba oil, 6 drops Peppermint essential oil, 6 drops Eucalyptus essential oil, 4 drops of Lavender essential oil and a teaspoon of Beeswax. Melt the Shea butter, Organic Coconut oil and Jojoba oil, then add the essential oils and pour into an airtight container and once cool give your muscles a soothing massage. Organic Coconut oil naturally contains medium chain triglycerides (MCTs), a type of fatty acid esters that absorb quickly and efficiently and help transport nutrients to the cells. Just massage Organic Coconut oil straight off the jar, into nails and cuticles to help strengthen them or rub into fingertips to soothe and prevent hangnails. In a double boiler, melt 10 tablespoons Organic Coconut Oil, 3 tablespoons cold pressed sweet Almond Oil and 4 tablespoons grated Beeswax. Remove pot from the burner and stir in 5 drops of Lemon essential oil. After cooling, massage it into your hands to hydrate and make dark spots go away. You can use empty lip balm tubs to fill up and carry this amazing natural hand cream around. Have you got dry, cracked feet? Rub/massage some Organic Coconut oil and go over the flaky areas with a pumice stone. If you want a more intense treatment, slather it on and leave overnight. A pair of socks will help to not get it all over your bed. Mix the juice of one lemon with a teaspoon of Organic Coconut oil and rub into dry and dark elbows and knees to help lighten dark spots. Organic Coconut oil is rich in Caprylic acid, a potent anti-fungal agent that’s excellent for treating athlete’s foot, Candida and other fungal conditions. Rub the oil into your feet; concentrating on the affected areas (you can add some tea tree oil for added healing). Repeat this 2-3 times a day. Organic Coconut oil has antibacterial properties; it’s also a great smelling. When you combine the two you get an amazing de-odourizer. Add a little Lavender or Lemon essential oil for an extra sweet smelling effect. A Simple Face Mask – Beat up one Egg; add ½ cup Organic Coconut oil and 1 tablespoon Honey beating until the mask has a consistency of Mayonnaise. Place in the freezer overnight and to use, cut out a small piece and smooth over your face; put the rest back in the refrigerator once done. Keep the mask on for 5 to 10 minutes, and then rinse off with warm water. You will feel refreshed! Another Great Face Mask – Just combine equal parts of Honey and Organic Coconut Oil onto your face and massage for 10 minutes. It transforms dry skin and your skin in general! Organic Coconut oil is the perfect substance to flush away impurities. 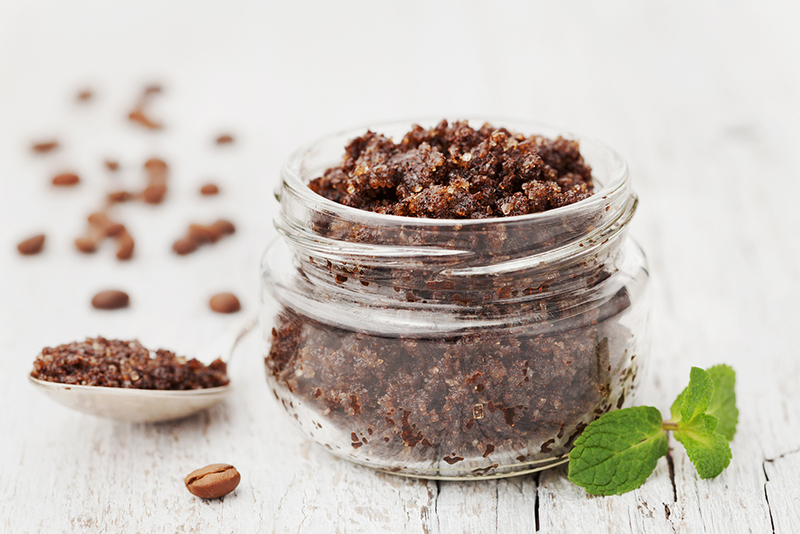 Mix equal amounts of oil and baking soda for a rejuvenating scrub. Use it and wash away with warm water, and then rinse with cold and pat dry. Use Organic Coconut Oil to Cleanse away the dirt and pollution by massaging coconut oil into your skin and then wiping with cotton wool or soft cotton cloth. Waterproof Makeup including mascara just melts away, while the oil’s anti-bacterial and anti-microbial elements protect and enhance the skin’s natural glow. Dab some plain Organic Coconut oil on your lips for the ultimate in hydration. The Organic Coconut Oil is solid at room temperature and melts with body heat while applying. You can use old lip balm tubs to fill up and carry the natural lip balm around with you. Use a dab or a small amount of Organic Coconut oil on top of your makeup. It looks like your skin but gives it all a good glow, which is why many famous natural makeup brands use it as a base ingredient in their make-up. Spray your Eyelash Brush with a little Organic Coconut oil and brush out your eyelashes to boost their growth and pigmentation. Apply a little bit of Organic Coconut oil directly to the age spot and it will help it fade by preventing free-radical formation (the primary cause of ageing). Earth’s Finest Organic Coconut Oil is so versatile you can even use it as home remedies or around the house. Take a look at the many ways one jar of Earth’s Finest Organic Extra Virgin Coconut Oil can be used. Organic Coconut Oil has antibacterial and anti-inflammatory properties and this makes it an excellent soother when you suffer from eczema. Lightly apply it on the affected area- 3-4 times a day. It’ll also help to soothe itching and give you some of relief. Rub a little Organic Coconut oil on the inside of your nose helps with runny noses, allergies and sore nostrils. The same anti-inflammatory properties that make Organic Coconut oil so soothing on sunburned or heated, parched skin also make it a great antidote for bug bites. Just smear a little directly onto the bites and you should start feeling some relief and watch those bumps go down. If your child or you are down with chicken pox, Organic Coconut oil can soothe the itchiness of it. A great way to help with healing is to add it to a warm bath with oatmeal and simply soak in it. Suffering from heartburn or Acid Reflux and going through the uncomfortable feeling can keep you awake at night. Just drinking a little bit of Organic Coconut oil can soothe your stomach and esophagus and relive you from the terrible feeling. Organic Coconut Oil and Baking soda make the perfect mixture for toothpaste. Just mix them with the consistency you wish. While Baking Soda works wonders by itself, adding coconut oil, with anti-bacterial properties fights the germs in your mouth. You can add spices like Cloves for extra combating of other diseases. If you want the general toothpaste tube flavour simply add some spearmint essential oil. Oil pulling is the latest health trend to replace mouthwash. Simply bring Organic Coconut oil to a liquid state and swish it around your mouth for 10-20 minutes. It foams up as it works around the germs and spit out. Do remember that it is oil and cannot be washed easily, so be mindful of where you spit out. Gain immediate relief by mixing 1 part Organic Coconut with 2 parts clove oil and using a cotton ball/swab to apply the mixture to the part of the gum affected by the toothache. Combine a half a cup of Organic Coconut oil with 10 drops of tea tree oil into a spray bottle. Close the lid, shake the bottle and then spray this natural formula directly onto skin to keep pesky bugs at bay. Warm baths are the coziest to have but generally leave your skin dry, add a few drops of Organic Coconut oil to it and it makes sure your skin stays moisturized. Even if you have dry skin, you should try this method. Try a drop or two of Organic Coconut oil for excellent results by using a dropper, tilt your head sideways to add the drops and tilt your head in the opposite direction to let the oil come out. The oil helps break up the wax and comes out with it. It’s a pleasant option to flushing out your ears. Using the same method in the case of an infection, or even by applying the oil, you will help to kill the infection quickly. Organic Coconut Oil fights bacteria as well as viruses and fungi, and can definitely boost your immune system. Don’t forget to take it regularly using the dosage of a tablespoon a day. Do make sure its Earth’s Finest Organic Virgin or Organic Extra Virgin Coconut oil, so you get all the health benefits from the natural oil. Consume a tablespoon of Organic Coconut oil a day and watch in the next month how you transform and become healthy and how circulation and overall health of your body improves. Dabbing a little bit of Organic Coconut Oil into each of your nostrils can start catching the pollen and spores that irritate you and cause allergies. This means your nasal passage will be clear and reduce symptoms. A Sensitive nose easily gets dry and bleeds in hot or cold weather. Dabbing a little Organic Coconut oil at the bottom of your nostril will protect capillaries and prevent the nasal passage to dry out resulting in Nose Bleeds. Sugar is often blamed for weight gain. When you take Organic Coconut oil it controls your cravings (especially sugar cravings) and is generally great for your metabolism, often increasing it and thus one of the key elements to loosing weight is sorted when you consume Earth’s Finest Organic Virgin and Organic Extra Virgin Coconut oil. Indigestion related to bacterial, viral or fungal infection can be cured if you take Organic Coconut oil because the saturated fats in Organic Coconut oil have anti-bacterial properties that help control parasites, and fungi that cause indigestion and other digestion related problems such as irritable bowel syndrome. It also increases your body of absorbing healthy nutrients, vitamins and amino acids from your food. With all these benefits you are guaranteed to be on the road to recovery and have a healthier you. Consuming Organic Coconut oil can raise your HDL (good) cholesterol levels. Use it in moderation, because too much of a good thing can be a bad thing and sometimes raise the bad kind of cholesterol too. Organic Coconut oil speeds up your metabolism and helps to soften stools. Organic Extra Virgin and Organic Virgin Coconut Oil consist of the necessary fibre to be a laxative. If you are not used to the oil, start small as taking it in large quantities might lead to it becoming a super laxative. Coconut oil is also a great treatment for hemorrhoids. Researchers have discovered that coconut oil may increase the fluidity of cell surfaces. This may boost the function of your lungs. Short-term benefits of taking Organic Coconut oil have been recorded. The ketones in the oil can help boost your brain health by helping patients to function better. For individuals who are chronically tired or stressed, taking Organic Coconut oil can give them an energy boost and prevent adrenal fatigue. The pain of arthritis comes from inflammation in your joints around the body. Organic Coconut oil can be effective, natural treatment for arthritis, and can reduce the inflammation of joints as research has shown. Organic Coconut oil helps to stabilize your blood glucose levels. This is useful when an individual has diabetes as well as adrenal conditions. When you take Organic Coconut oil, your energy levels are more stable during the day! Take a tablespoon of Organic Coconut oil before you hit the gym and have an extra burst of energy that won’t affect your blood sugar. Coconut Oil is proven to stimulate your metabolism, improve thyroid function, and escalate energy levels, which all helps to decrease your unwanted fat, while increasing muscle. Mix Organic Coconut Oil, Beeswax, Eucalyptus Oil, Peppermint oil, Rosemary oil and Clove Oil to make an amazing vapor Rub to use on you or children. It has been reported that by taking one or two tablespoons each day helps to provide relief during the turbulent Menopause by preventing hot flash symptoms or reducing it as well. This is a wonderful way to soothe and relax after a tiring day. Organic Coconut oil is perfect for aromatherapy; you can add some on an oil burner and have a very tranquil, beautiful aroma surround you. Apply Organic Coconut Oil to the baby’s skin covered by the diaper. Due to its’ anti-bacterial properties, it’s a gentle medium to prevent diaper rash. Mix half a cup of Organic Coconut oil and two cups of corn-starch to make play dough. Since it is edible, it is a safer alternative to commercial play dough. You can even give it to older children in case there are fights. Adding food colour will give your play dough a little bit of a character. Create an all-natural mixture that is perfect for sensitive skin. All you have to do is mix half a cup of Organic Coconut oil into raw and unrefined Shea butter until you get the general texture of baby lotion. You can use this homemade lotion or just normal Organic Coconut Oil to massage your Baby.